So there we stood at the Warrensburg train station in the hot sun. It was a bit disorienting. We loaded up all our gear and went in search of a good place to eat lunch. Oh how I love little midwestern town restaurants! We ate a hearty country buffet at Heroes Restaurant. Great fuel; it was already after noon but the hard part of our day was just beginning. After lunch we hit the roads. 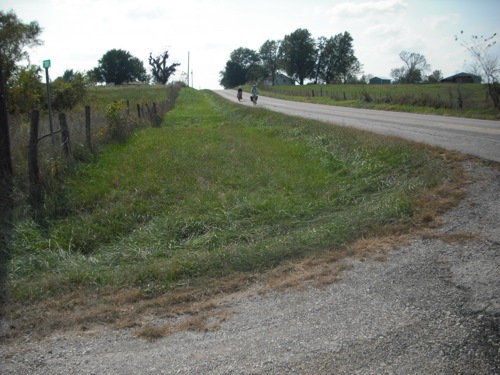 I had mapped out the 35 miles to the Katy Trail Head in Clinton along back country roads. I checked the Google topography map and it looked pretty flat. I was anticipating a nice sunny ride through the farmlands. Gerry stopping on the side of the road for sunscreen application. Our first clue that things were soon to run awry was how terribly hilly the roads were… incredibly difficult with our heavy loads. Thirty five miles of this was going to be tough. Then we made a bad turn which took us several miles in the wrong direction. Oops my fault… I was the navigator and the roads aren’t marked very well out there. After tooling along several miles with the sun decidedly on the wrong side of us, outrunning two crazed dogs, and searching in vain for marked street signs I finally realized we were lost. We had to ride another mile before we found a street sign and I could figure out where we were. The trouble with getting lost in the country is that you have to travel so dang far before you get to the next road. 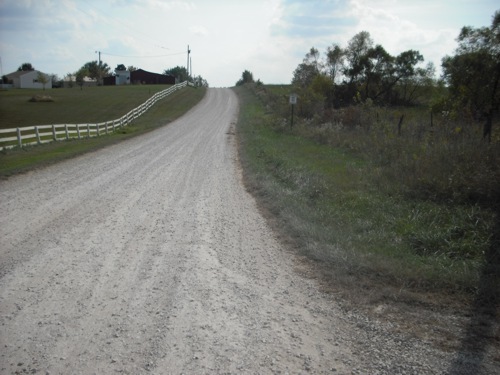 The quickest way back to where we wanted to be was an unpaved gravel road (see pic below). It only took a few yards to realize that it was just impossible to ride our loaded hybrid bikes on that huge gravel. Our bikes were slipping all over the place. A helpful farmer told us that the best way to get to Clinton would be to backtrack several miles and then take Highway 13 all the way down to Clinton. I had hoped to avoid riding 35 miles on a highway. But it looked like we had no choice. Apparently a lot of the backroads on my intended route were going to be gravel. The gravel looks so tame in this picture. Those rocks were really big. Craig and Gerry coasting downhill. Craig and Gerry all packed up and ready to go… but we’re lost. (the yellow line from Warrensburg to Clinton) instead. Just when I thought it couldn’t get much scarier I heard Craig yell. He told us that he was suffering from terrible leg cramps and had to get off his bike to walk. This was weird. Craig is a strong healthy guy and never has problems like this. He told us he had been in excruciating pain for miles but had stoically pedaled on in silence until he couldn’t take it anymore. He insisted that Gerry and I continue on and he would catch up to us later. I didn’t want to do this but Craig was adamant and I knew that the only way we could get help for Craig (if he ended up not being able to pedal the distance) was if we got to Clinton as soon as we could. 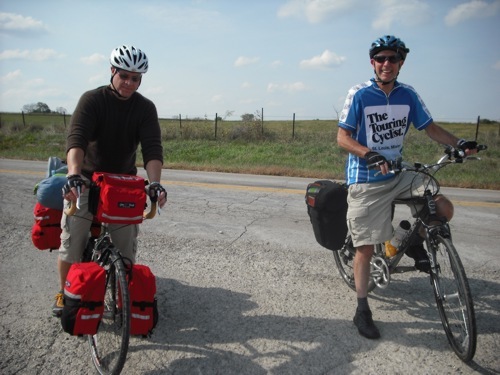 So Gerry and I pedaled on leaving Craig behind about 20 miles from Clinton. I was second guessing myself the whole 20 miles… you know the kinds of things worriers worry about… what if Craig has such bad cramps that he falls in front of a car? What if he doesn’t make it to Clinton by dark and a car hits him?? What if something happens to him and we can’t find him later?!? WHAT IF ALL WE FIND IS A BLOODY MANGLED BICYCLE!?!?!?!?!? Gerry came up with the plan that when we got to a gas station, we should try to call a cab or shuttle service and go pick up Craig. Good plan! But there was not a single gas station or any services of any sort the entire 20 miles to Clinton. So Gerry and I pedaled on down the hilly, scarey Highway 13 and pulled into the first Clinton gas station hours later right at dusk. I ran into the station and explained our problem to the young girl behind the counter. She was very nice but didn’t know of any way to help us and handed me the phone book. I made sure to explain more of our situation to her as I leafed through the phone book hoping someone else in the station might hear me and be able to help. We had left Craig hours ago and had no idea where he was. For all we knew, he was still 20 miles away. We had tried to call his cell phone several times during the afternoon but could never get a signal. “YES!!!! Did you see him?? ?” Turns out Craig was not that far behind us, less than a mile away. YAY! Gerry asked if I wanted to wait there for him to catch up. “NO! Let’s go get him now!! !” I was so excited and relieved that he was okay and nearby. Gerry and I turned on our blinking bike headlights and peered into the encroaching darkness for Craig coming the other direction. I couldn’t wait for him to see our headlights and know we would be reunited soon. And it was a very happy reunion. He had struggled with terrible full body cramps for hours and just when he thought he couldn’t take it any longer, the shoulder had widened out about six miles north of Clinton and a tailwind picked up and pushed him on down the road until we found him. We stopped again at the gas station, fueled up a bit with some energy drinks, got directions to the nearby Katy Trail Head and bicycled there in the dark to find someplace to set up camp. Our itinerary had been to ride 16 miles up the Katy Trail to camp in Windsor the first night but that obviously was not going to happen. Day was done and we were done for the day. The Clinton Trail Head is in town but located next to a large city ball field so it seems somewhat separated from the population. There isn’t an official campground there but I had read that the city will let people camp in the ballfield park so that was our new plan. There was no one around when we got there so we wheeled our bikes into the dugout. Craig and I tied our hammocks to the rafters and Gerry set up his tent inside the dugout. What a nice comfortable camp our first night after one heck of a long hard day! !